In 1620, the Mayflower, a boat with 102 men, women and children on board, sailed across the Atlantic Ocean to settle in the New World. In their native land, in England, this religious group had not been allowed to freely practice their religion. So they went to America in search of religious freedom. The Pilgrims settled in what is now known as the state of Massachusetts. In the autumn of 1621 they got a bountiful harvest of corn, barley, beans and pumpkins. The colonists had much to be thankful for, so they planned a feast. Local Indian chief and ninety Indians were present. The colonists learned from Indians how to cook cranberries and dishes of corn and pumpkins. Later, George Washington suggested the date November the 26th as Thanksgiving Day. Then in 1863, after the Civil war, Abraham Lincoln suggested the last Thursday in November to be the day of thanksgiving. Foods, eaten at the first thanksgiving, have become traditional. The traditional thanksgiving meal consists of roast turkey stuffed with herb-flavoured bread, cranberry jelly, mashed potatoes and pumpkin pie. Other dishes may vary as to region: ham, sweet potatoes, creamed corn. Football is the most popular game on this day. For many schools, the Thanksgiving Day game is the most important game of the year. Usually there are several football games to watch on TV. Thanksgiving Parade is held annually in New York City. Celebrities, floats, bands, and balloons shaped like famous storybook and cartoon characters appear in the Parade. Santa Claus arrives at the end. His coming marks the beginning of the Christmas season. Stores, classrooms and homes are decorated with turkeys, pilgrims, Indians, wreaths of dried flowers, and vegetables. Horns of plenty are also very popular. 1. Who were the people that started the celebrating of American Thanksgiving? 2. What was the name of the boat they had sailed to America? 3. What difficulties did they face in their first winter in the New World? 4. What were they taught by the American Indians? 5. Who participated in the first feast of Thanksgiving? 6. What is the date of Thanksgiving and how it was adopted? 7. 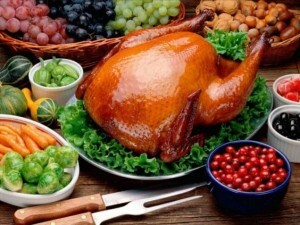 What are the traditional dishes on Thanksgiving? 8. What is the most popular game on this day? 9. How do people decorate their homes on Thanksgiving Day? 10. Where does Thanksgiving balloon parade take place? Don't forget to say «Thank you» to your nearest and dearest as often as you can! Эта запись написана автором Елена Шрамкова, 23.11.2015 в 01:02, и размещена в категории Топики. Следите за ответами на эту запись с помощью RSS 2.0. Вы можете написать комментарий или разместить обратную ссылку на своем сайте.